Creating an index is a two-part process. You mark the entries and then build the index. Select the range of text that you want to index. In the Bookmark name box, type a name, and then click Add. Click References > Mark Entry. In the Main entry box, type the index entry for the marked text. Under Options, click Page range. In the Bookmark box, type or select the bookmark name that you typed in step 3, and then click Mark. 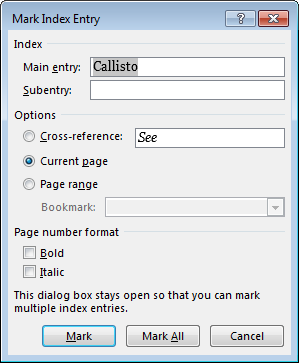 After you mark the entries, you’re ready to create the index and insert it into your document.